I once answered some questions about life in Venezuela for a guy who worked at this school (Jared maybe? ), but other than that one time, I had never really heard of Bahrain. I remember him being very happy with his school and thinking that Venezuela didn’t measure up. I’ve poked around online and I’ve heard good things about Bahrain. Let’s see how Riffa Views measures up using my rubric! I give this school a 10/10! According to the RVIS website there are 350 students from 22 different countries. Very diverse! Class size is not listed anywhere that I can see on the website, but I did find this pdf that details the ratios for various age ranges. It seems from this page on the RVIS website, that the average class size is about 22 students (not too bad), with some classes have two teachers, others sharing an assistant, and still others having only one adult in the room. 1-1 laptops AND a Smart Board. I still haven’t been at a school where elementary teachers have easy access to Smart Boards! Fantastic! This school contributes 10% toward retirement if the employee puts in 5%. Pretty good! This school has a pretty nice package! While they don’t list their pay scale on their website (bummer), on this website it says that pay is between $30-65k for newly hired teachers! It also says that the average teacher can save $25K per year. Wow! One thing that bothers me (especially without being able to see the pay scale) is that, “A new employee is given credit for one step on the Salary Schedule for each two years of prior teaching experience…” Normally you get credit for each year of teaching. There is also a Foreign Service Premium (FSP) which is 25% of the base salary, an end of service bonus (15 days to 1 month of pay), housing (villas in this case), utilities, annual airfare, shipping allowance (including an allowance at the end of service), relocation allowance, 50% medical and dental covered by employer. This school is one of the few that pay into US Social Security and Medicare which means that there are some small monthly deductions. Also $2000 every two years for professional development! Whew! Good deal! The school website says that the school is about 20 miles outside of the capital and that, “The Kingdom of Bahrain (Bahrain) is a small island (727 sq. km, 274 sq. mi.) located in the Arabian Gulf (GMT+3) and the capital is Manama.” The school and teachers’ housing is on a professional golf course which features a gym and a large pool! Faaahhhnnncccyy dahling! According to the RVIS website Bahrain is, “… home to the region’s biggest and most luxurious spa, the Banyan Tree Spa Al Areen. Bahrain has restaurants, expatriate clubs, pubs, sporting clubs, and movie theaters.” It is also known for water sports and for being one of the more liberal areas in the Middle East. It doesn’t look like there is a huge salsa scene in Bahrain, but this FB group has an event every Friday. This FB group lists at least two events every week! I can work with that! The faculty descriptions on the RVIS website are very thorough! It looks like the teachers at RVIS come from a variety of backgrounds. Also, this page, describes everyone as being very friendly and open which is great since everyone lives on the same street! Like many countries in the middle east it can be slightly challenging to get pork products, though it is not as difficult to find them here as it is in other Gulf countries, but other than that, you can find EVERYTHING! It is an island so seafood is also very popular. Also, if you are a non-Muslim it is said that alcohol is widely available so you can still have your wine with your dinner! AND coffee and hummus are very popular here. It sounds like a good place to me! Please comment! 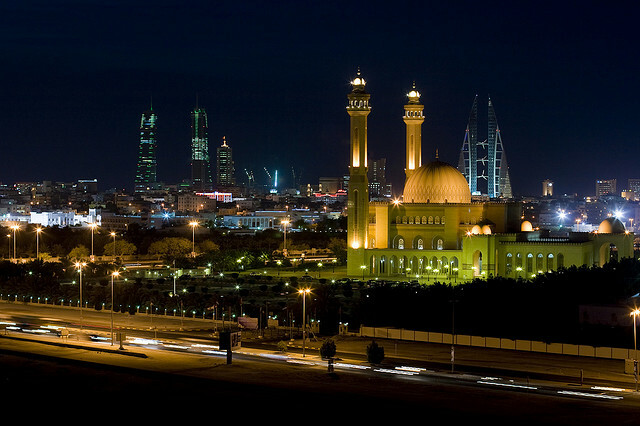 Have you been to Bahrain? Would you want to work there? Have you or someone you know worked at Riffa Views International School? Can you add any info to what I’ve listed above? P.s. I did contact the Vice superintendent over at Aramco to ask him to try and recruit you! 🙂 Not sure if you interviewed with them. All the best to you, Amanda! Hi, Valerie. Thanks for the comment full of such great info! I will be sure to check out that yoga place you mentioned because it sounds fantastic. Also, I’m excited to try out that spa you mentioned! I’m afraid that you will be going to Chile before me so I don’t have any tips to offer (other than the people I’ve talked to said to always order the set menu at lunch to save money). I will go to Santiago and Valparaiso in April for Spring Break (Semana Santa). I’m still figuring out my itinerary and other details, though. I did not hear from Aramco, but perhaps that is because I said I wouldn’t be attending any job fairs this time around. Maybe in a few years I will be looking again and I can finally interview with them.